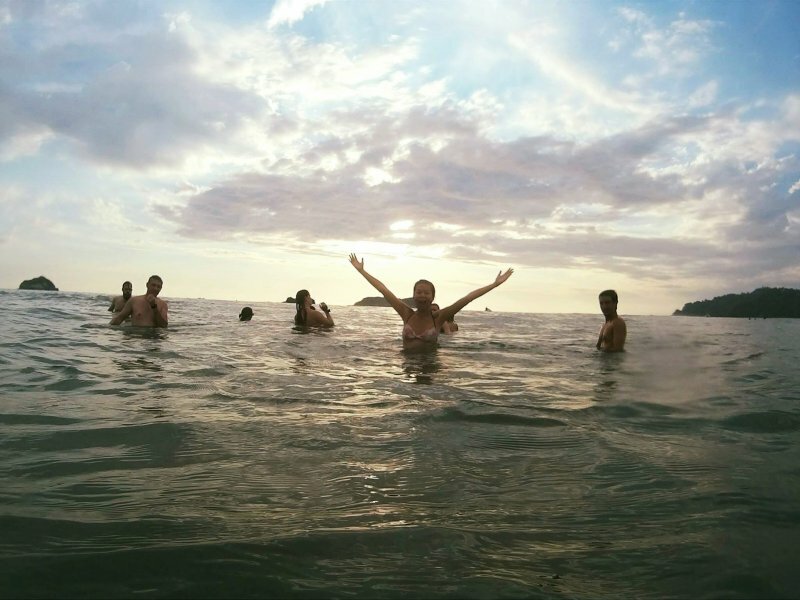 Awesomeness.net: Writings and Musings » Costa Rica Quest (with G Adventures) – PURA VIDA! 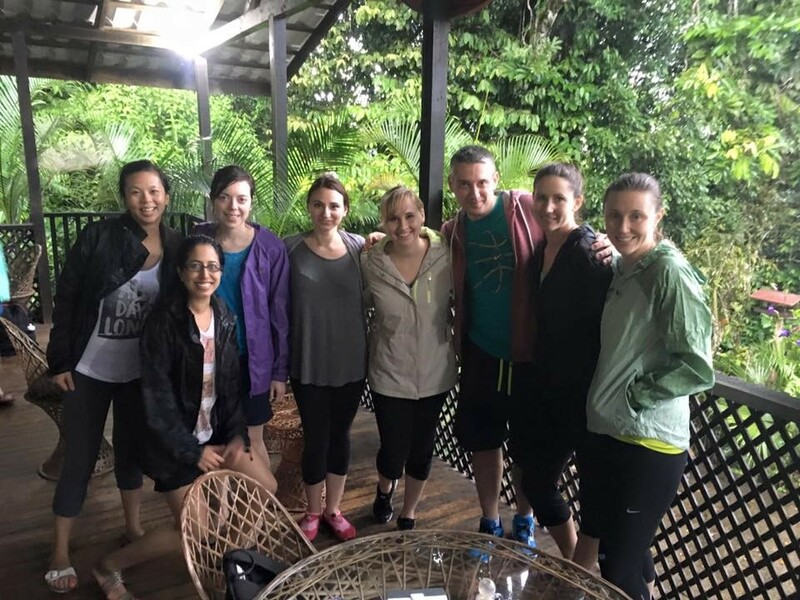 HomeReviewsCosta Rica Quest (with G Adventures) – PURA VIDA! I arrived in San Jose, Costa Rica two days before my tour started and decided to stay at a different hotel than the joining hotel. Let me tell you I am glad I did because the joining hotel was not at all great. 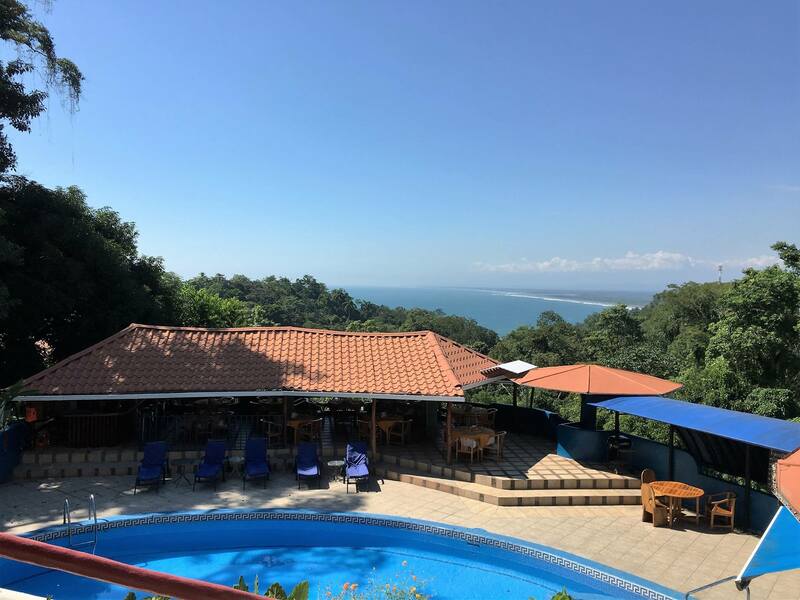 So if you somehow come across this post from Googling about Costa Rica Quest, I highly suggest you book the Apartotel La Sabana hotel (see my in-depth review here) which is about a 10 minute walk away from the joining hotel, Hotel Autentico (my review of that abysmal hotel is here). First night we met up with our tour group. I really liked the mix of people in my group, which skewed closer to my age than previously when I was in Contiki groups as a mid-late 20s traveler and everyone else was late teens/early 20s — and I felt old. There was a good vibe and felt like we would get along from the start. Our CEO/tour leader, Edgardo, also seemed like a great guy right off the bat. Next morning, we departed bright and early on a private van to head to La Fortuna. 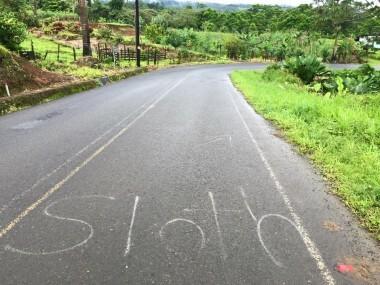 On the way, we saw a sloth in the tree! Alas, I only had my iPhone with me which sucked for zooming in. There was an opportunity to go white water rafting early in the morning and then join up with the rest of the group later on but no one ended up going. The other optional activity available for the day included canyoneering/canyoning in the “Lost Canyon Adventure“. This included repelling down waterfalls, down climbing and river tracing in a deep, tropic canyon. Unfortunately though, as we were told is typical of La Fortuna, the weather was not on our side as it was raining pretty hard and grey skies. And with the rain, it made it much more difficult to navigate the terrain, as it made water levels higher and more muddy, ultimately causing me to fall directly into the rocks and scrape up my elbow and knee pretty badly. But it was SO fun. There were 4 waterfall repels, my favourite part, where you bounce down and then when the guide screams “let go”, you zip line down the rest of the way. We stayed at Monte Real Hotel while in La Fortuna, a pretty nice and central hotel. The next morning, we had to be ready to go at 7 am to go on the Cerro Chato extreme hike (another optional activity, which not everyone in our group went for. Some went kayaking, paddle boarding and horseback riding instead). Our group was reading the description of the activity and it described it in terms such as “intense 5-6 hour hike” and “recommended for people in good shape and willing to hike in extreme conditions”, and hell, the name of the activity itself had the word “extreme” in it. But we were like, BUT IS IT REALLY EXTREMEEEE? And we somehow convinced ourselves that it was just to discourage the elderly and extremely out of shape people from going on it, but nope, it includes people like me too. I am in decent shape, I go to the gym about 3 times a week and I was pooped even when we were trekking over inclined terrain to GET to the forest part of the hike. It was really difficult and pretty much the most physically challenging thing I’ve ever done in my life. I have never sweat that much before either. Here’s a quick 10 second clip I accidentally recorded as I was climbing up the very steep, very muddy terrain, to give you an idea that this wasn’t some regular hiking path. And since we had started at 7 am, with no breakfast, I really thought I would faint (if it’s one thing Full House has taught me, it’s that you should not do physical activities on an empty stomach or you’ll end up like DJ Tanner at the gym!) and then roll down into a ditch to my death. Luckily, I made it out alive. Though at the top, it was really foggy and since it was so muddy that day, we were unable to go down to the emerald-green lagoon at the top as it was too dangerous. After hiking back down (which was actually more difficult than going up because now you’re also fighting with gravity), we ate lunch and then went to the La Fortuna waterfalls. We climbed almost 500 steps down to go swim at the bottom of the waterfalls (it was really chilly, but refreshing after that strenuous hike). Then the fun part came, climbed up about 500 steps to go back up. Later that night, we went to Los Lagos Hotel for their hot springs (part of the tour’s included activities). OMG, it was such a welcomed, relaxing post-extreme hike activity to do afterwards. The place had many different types of pools; some were hot, some warm, some cold. There were a few slides too. It was a great night. The next morning we boarded a boat to go over to Monteverde. First thing we did in Monteverde was a coffee plantation tour that was in the included activities. It was the El Trapiche tour (my review on Trip Advisor) and came with a delicious lunch. 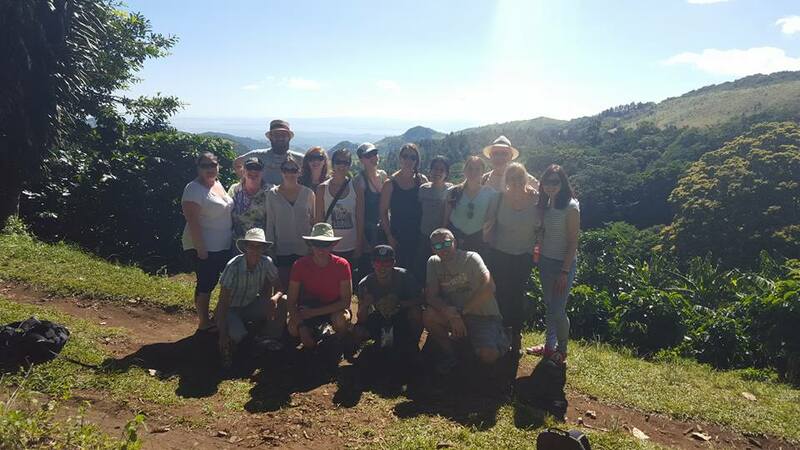 It was actually quite an interesting tour to learn more about the coffee process and also about chocolate making with cacao beans. Afterwards, we went to the hotel we stayed at while in Monteverde, Hotel Cipreses (see my review on Trip Advisor) to drop off our things before heading out to a restaurant called Tree House Restaurant and Cafe. And you might’ve guessed it, it was a restaurant… with a tree growing through it. After dinner, I signed up for the optional activity, the night walk. It seemed to be highly recommended by previous people who had done the tour, but I heard that we would see snakes, bugs, spiders, etc on this night walk — while we are enveloped in darkness — so it made me apprehensive. But you know, YOLO, just putting aside my fears and worries and just doing it and so I did it. Yes, I did see snakes and creepy bugs. And a tarantula. We had a moment of panic while screaming in the dense forest when someone felt and saw a giant spider on their leg. 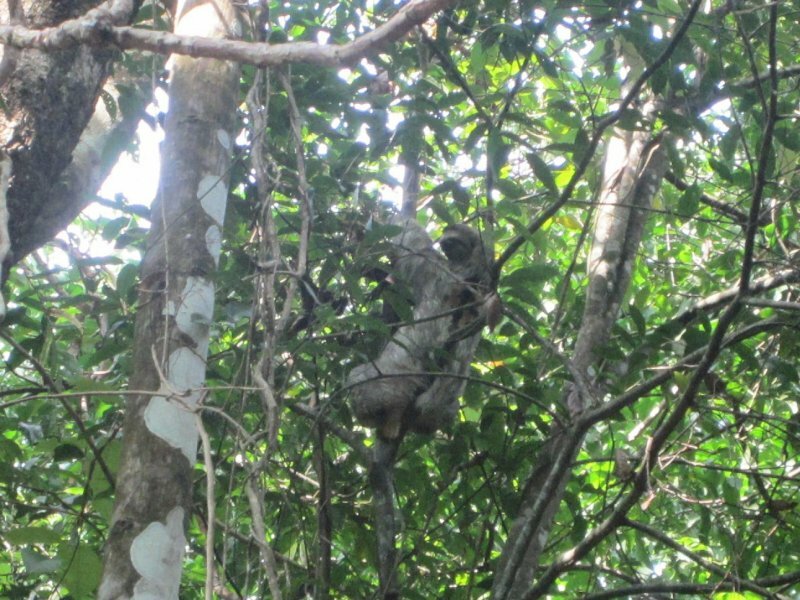 But I did get to see a giant sloth in the tree (love sloths! ), sleeping birds and bats. We also saw a lot of ants carrying leaves and had to be careful not to step on them. 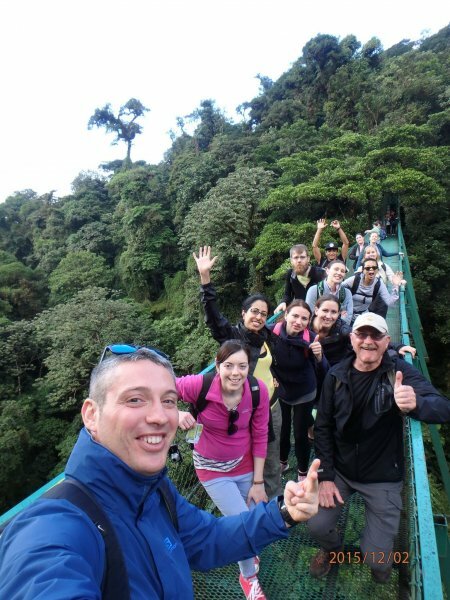 Next morning we went to the Santa Elena Cloud Forest Reserve, one of the other included activities, again led by the same fantastic guide we had the night before on the night walk. Beautiful place with all sorts of wildlife (including, yes, creepy bugs). There was also a look-out point we could climb up to the top, with some ladders (I have a fear of heights so it required the “don’t think, just do” approach again), and get a fantastic view overlooking the cloud forest below. Here’s a video from doing a 360 at the top. Then came one of my most anticipated activities for my Costa Rica trip: ZIPLINING!!! We went to 100% Adventura Adventure Park where their course includes a mix of 14 cables of regular, sitting down ziplines and Superman ziplines (lying horizontally below the zipline, one of the two Superman ziplines being the longest zipline in Latin America at 1590 meters in length!). There was also a repel and the well-known Super Tarzan Swing. I originally wasn’t planning to do the Tarzan Swing but I guess I bowed down to peer pressure. The Superman zipline I was also iffy about because the guides there had told me that people who weigh under 120 lbs will get stuck on the longest zipline when in the Superman position. Let’s just say I am around 120 lbs, give or take, and I could probably get stuck. And I did, needing to be rescued a.k.a. pulled rest of the way by a guide somewhat nearish to the end of the line (thankfully, though being stuck like that did not feel great on my ribs and was scary to look down). I also did the Tarzan Swing which included just being “gently nudged” off a plank way up high and then free falling for about 5 seconds, then swinging back and forth. Another just DO IT and DON’T think situations. Below are some videos of the Tarzan Swing, the superman ziplines and the regular old sitting down ziplining. 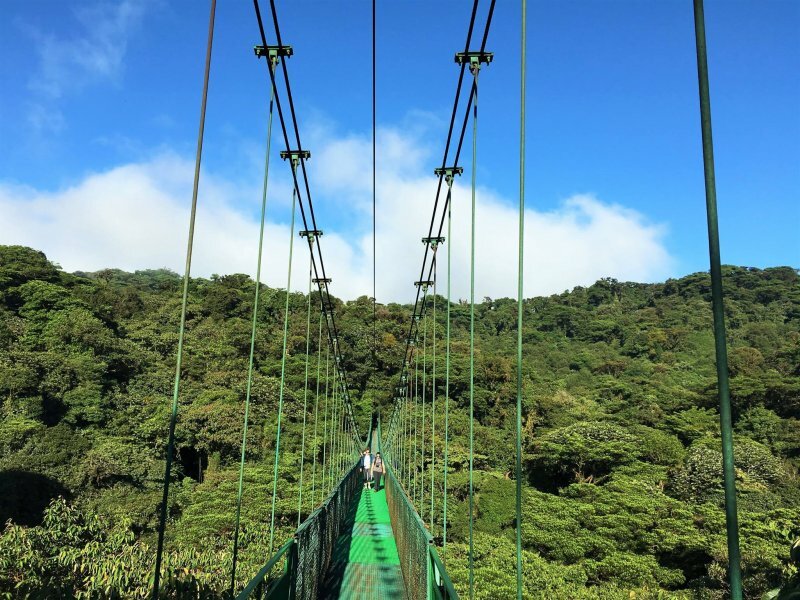 After a day of ziplining, we went to the hanging bridges in Selvatura Park — a 1.9 mile (about 3 km) trail that crosses the Monteverde Cloud Forest. 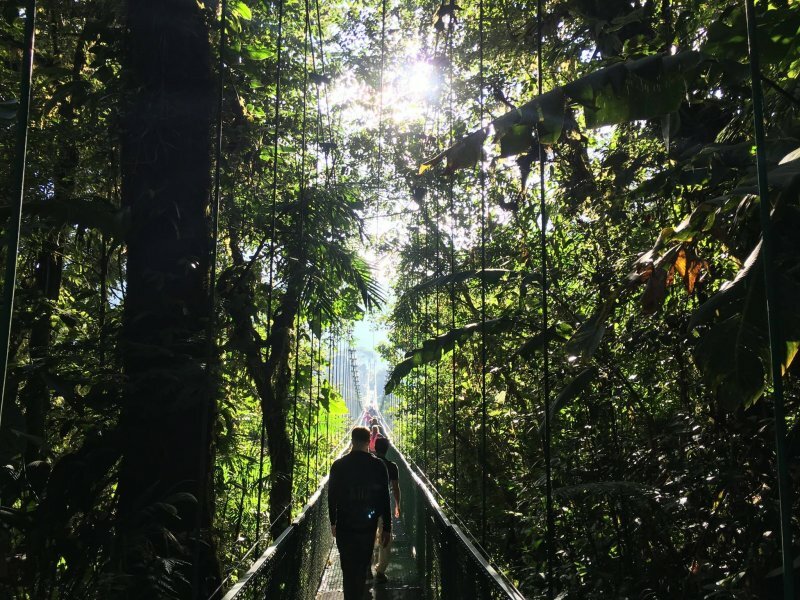 The hanging bridges were of varying lengths (150 feet to 510 feet) and varying altitudes (from 36 feet up to 180 feet). We saw some monkeys down below in the forest too! Video of the walk over one of the 8 hanging bridges in the park. Next day, we headed to Manuel Antonio/Quepos (our hotel was in between both towns). There was a dramatic weather shift, going from warm days and chilly evenings to just hot and humid. Just standing outside waiting for the bus for a couple minutes resulted in being drenched in sweat. The hotel we stayed at, Hotel California, was up a really steep hill but it was worth the walk up. There was a beautiful view of the Pacific ocean. And there were adorable titi monkeys galore on the hotel grounds! Manuel Antonio beach was a 10-15 minute bus ride from the hotel, though waiting for the bus and the bus schedule being unpredictable, made that much lengthier. Having the beach and relaxation portion at the end of the trip definitely was nice as it helped me get both a taste of the adrenaline racing activities and the relaxation needed before heading back to work. There were some huge waves at the beach as well! The next day we went kayaking in the mangrove. I thought it’d be really relaxing but since we were always trying to catch up with the group, it was less chill and slowly paddling sort of activity than it was paddling strenuously. Luckily, while I originally had thought it was going to be a person per kayak, we had to pair up so that helped with sharing the paddling/steering duty. After kayaking, we went to visit the Manuel Antonio National Park. LOTS of wildlife here, including my favourite, sloths! Also spent most of the afternoon on the beach accessed through the national park so it was less crowded and much nicer than the public beach we went to the day earlier. 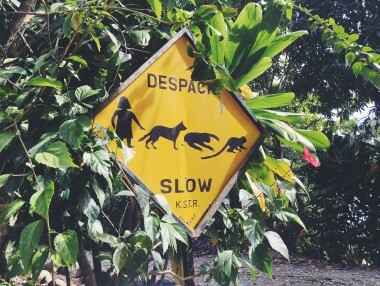 But you had to be careful with your belongings because there were monkeys and raccoons (the latter of which looked a lot different than the raccoons I’m used to as they were thinner than the fluffy, pudgy North American ones) with sticky fingers. I saw them take some bags of food from people and they actually were pretty smart, even managing to steal from a bag hanging from a tree branch. Then at dinner we went to the most amazing charcoal BBQ place ever. On the last day, though technically not the last day as they count the morning departing day as the last day, some of us who didn’t go on the party boat optional activity just chilled out at the beach one last time. Then the few hours van ride back to San Jose. If you are considering this trip, DON’T THINK. JUST GO!! Great review, I am going on this trip on Jan 26th! This was a great overview – I’m taking this tour in February! What did you pack for the trip? Was there anything you didn’t have that you wish you’d brought (or anything you had with you that you really didn’t need)? Well one thing I really wish I brought (but luckily I had an awesome mother/daughter fellow tour group members who let me borrow theirs, which was veryyyyy nice of them) is hiking boots. They were listed as optional on the packing list and I never planned on going hiking but if you end up doing the extreme hike (which, like me, was due to last minute peer pressure/FOMO), you really, really need to bring hiking boots. I just had brought Converse shoes as my “walking shoes” and it would’ve been a lot more difficult and dangerous. The other “hikes”, and I use quotes because they were not that difficult to do with running shoes, are fine but there is a lot of walking on those so you may want a shoe with better support. I also wish I brought maybe one extra pair of long pants than what the packing list advises — you’re also going during dry/high season and I am not 100% the weather specifically in the locations the tour visits during this time, but it wasn’t like really hot anywhere other than Manuel Antonio/Quepos. So a good chunk of the trip, I was wearing long pants or capris (side note: it’s a good idea to bring clothes that you’d wear to the gym, like leggings, Dri-Fit, etc since they are the most comfy for the activities). Also wish I had gotten some Costa Rica Colones for buying things there, because while most places take USD, you get a better deal if you pay in Colones. Plus I’m Canadian so the USD exchange was extra terrible for me. The list suggests bringing reading material, and I did, but I really never ended up reading on the trip. The beach time wasn’t extensive so it was less of a “sit on the beach and read” thing. And being in the van, you’re looking at sights so I wasn’t reading then. I only read at the pool at my pre-tour hotel stay. Also depending on how iffy you are about rain, I found no use for my umbrella. You’re just going to get wet and usually it’s short spurts of rain in dry season. No need for a flashlight, the only time you need one is on the night walk but they supply them for you. 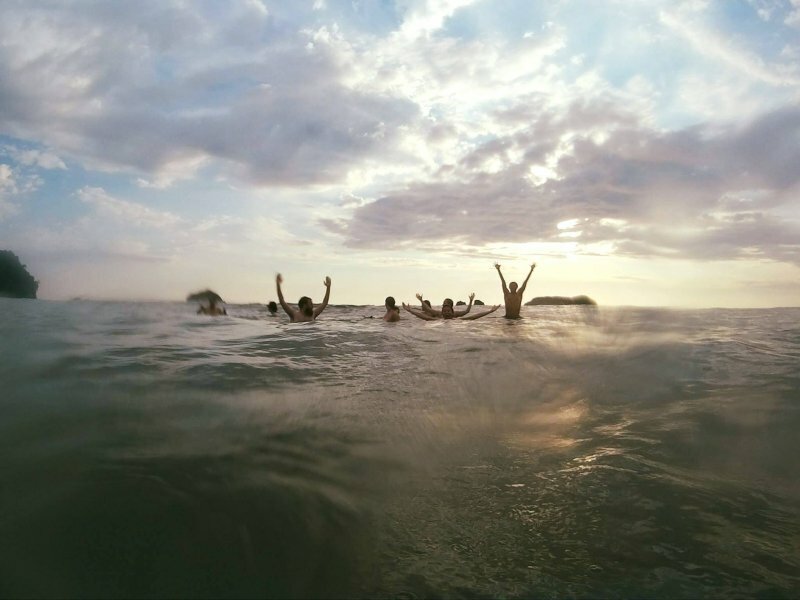 It is an amazing trip, have fun! Hey! What did you use to capture all your photos & videos? Definitely my next country to visit. I see Los Lagos hotel is no longer included, and the Extreme Volcano hike is no longer an option. Still looks incredible though. Excellent Review, I’m heading on that tour in the next few weeks, wondering what cameras you saw? Trying to select which gear to take. Can you get away with just a waterproof P&S?